He's very pleased with how treatment went, he searched and poked for any bumps around my body and could feel none, asked about side effects from treatment and how I am, had bloods taken, and all that general doctor stuff. Scar tissue can show up like active cancer, and even though any signs would most likely just be scar tissue at this stage, he would be obligated to put me through another biopsy. Which he simply does not want to do at this stage, as he really believes I've responded well to treatment and it would be unnecessary pain. An unnecessary PET scan = unnecessary radiation (even though it really is only a small dose). 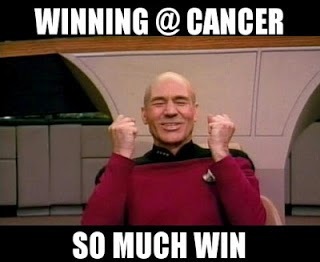 This isn't to say I'll never have another PET scan, or that the radiotherapy team won't want to do one now (when I next have a check-up appointment with them). So, without the PET scan, how do I reach the stage of the illusive 'remission' word, and what's next? I'll have check-ups with the Haematologist every 3 months, where he will do bloods, poke for any new swollen lymph nodes and do the odd chest x-ray. This usually continues for 2 years and from what I gather after that (assuming I remain cancer free), the appointments will only be every 6 months. Still, when do I hear this R word then?? -After discussing it with some people on the online groups, apparently you may never actually hear that word! But that's not to say you aren't cancer free -it's just not always used. I did not know this -again, screw you TV for giving me ideas of a completely different reality, haha. I do understand why it's a word specialists are afraid to use... at the same time, everything's looking good according to the Haematologist, and nurses, so I'm going to take this as either I am in remission, or very nearly so, and treat it as such!